His Holiness Pope Francis has appointed Fairbanks Bishop Donald J. Kettler to lead the diocese of St. Cloud, Minnesota. The Vatican announced the appointment at 2 AM Alaska Time today. Bishop Kettler was in St. Cloud and joined diocesan officials for the announcement. The installation is scheduled for Thursday, 7 November 2013. In the meantime, Bishop Kettler will prepare the Fairbanks diocese for a smooth transition. Until Pope Francis appoints a new bishop for Fairbanks, an appointed administrator will direct the diocese. Bishop Kettler has served 11 years as the head of the Catholic diocese of Fairbanks which encompasses more than 400,000 square miles. He was ordained Bishop of Fairbanks on 22 August 2002, the first diocesan bishop for Fairbanks. Previous bishops were drawn from the religious missionary order, the Society of Jesus. Bishop Kettler oversaw the darkest period in the diocese’s history when almost 300 people accused priests, religious, employees and volunteers of sexually abusing them in the 1950s, ‘60s and ‘70s. In the face of that revelation and to fairly address the harm, Bishop Kettler filed for Chapter 11 reorganization in federal Bankruptcy Court on 7 March 2008. The diocese emerged from bankruptcy almost two years later, in January 2010. The three Bishops of Alaska pictured while gathered in Anchorage for a recent Alaska Priests’ Convocation. 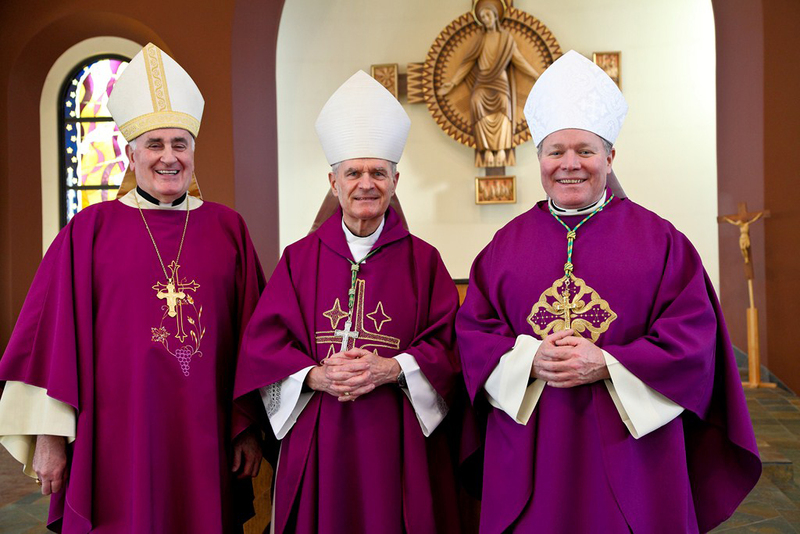 From left to right: Bishop Donald Kettler, Fairbanks; Archbishop Roger Schwietz, Anchorage; Bishop Edward Burns, Juneau. Photo by Ron Nicholl, Anchorage. Reflecting on his new assignment, Bishop Kettler says he was surprised when he received the call in early September from the Papal Nuncio Archbishop Carlo Maria Vigano, who communicated the Pope’s wishes for the appointment. Bishop Kettler graduated from St. John University and Seminary in Collegeville, Minnesota, which lies in the Diocese of St. Cloud. He served 31 years as a priest in his home diocese of Sioux Falls, South Dakota before being appointed Bishop of Fairbanks. Sioux Falls lies 220 miles west of St. Cloud. “My time in Alaska has deepened my sense of the church’s missionary role. I hope to bring that perspective to St. Cloud, which already enjoys a rich and vibrant history,” says Bishop Kettler. St. Cloud Bishop Kinney submitted his letter of retirement to the Holy See June 2012. Canon Law directs a bishop when reaching the age of 75 to file for retirement. The process for selecting a new bishop is bound by confidentiality, but culminates with candidates’ names being forwarded to the Holy Father for a final decision.